Got a set of these with brand-new Steelfiber shafts and brand-new Iomic grips. I hit the mother lode! Okay, so the cache of hitting a Mizuno certainly juices your opinion of yourself. That said, for so-called player's irons, these are a dream to hit. Longer than my Callaways. But more importantly, straighter. Only that I didn't get them sooner. A nice club but doesn't have the great feel of some other Mizuno irons - a hard feel - I was surprised at that. My Callaway X20's have a better feel & are a better club - shocking. MP60 and MP 32 have a better feel. MP58 are pretty solid and do have some forgiveness. I was hoping they would feel like the old Mizuno Pros - not even close. Mizuno always answer my emails within one day - very nice. Callaway X Tour Forged, X20's, Mizuno Pros, MP 60, MP 32, Titleist 735 & 755, Taylormade 1.0 & 2.0 and lots more. Had the clubs now for 2 yrs and still liking them...only issue is the swing weight. I need a D5 and they come stock as a D2, so make sure when fitted get the right swing weight. They hit straight and far when balanced correctly. Even off hits go straight…I recommend them! I purchased these irons last year to replace my MP-60s both of which had Dynamic Gold S300 shafts. I really liked the 60s but find these to be a little more forgiving with similar workability not to mention great much better looking at address and in the bag. One other thing to note is that I am 6'3" and the MP-60s I had were standard length with 3/4" plugs in them. I purchased the MP-58s from Mizuno with my correct measurements. This certainly attributed to the performance for anyone thinking of buying them standard and extending them themselves. Haven't had to deal with it. Upon first glance these are just a beautiful set of irons. I switched from my TM RAC TP. Bought them from golfsmith and hit them decent, took them to the course and it was terrible, could not hit them to save my life, although on the occasional well struck shot I was still liking them, just not sure if the DGS300 is the right shaft for me so I recently put in the Proj X 6.0, have yet to hit them but will post a later review based on the new shafts. Don't get me wrong, great set of irons when you hit them pure. Everything about them is top notch, looks, feel, everything. I bought these only because it was a great deal from someone who bought them but changed their mind. I was happy with my MP-62's and thought that I would try these and if I didn't like them I would sell them. Well, after two swings on the golf course with these, I was sold. I played a few more holes and didn't always hit these perfect but that was my fault. If you put a good swing on these clubs they will perform. Great clubs with great feel. By the way, I sold my MP-62's. Mizuno Golf Introducing the new MP-58 irons with revolutionary Dual Muscle Titanium Technology. 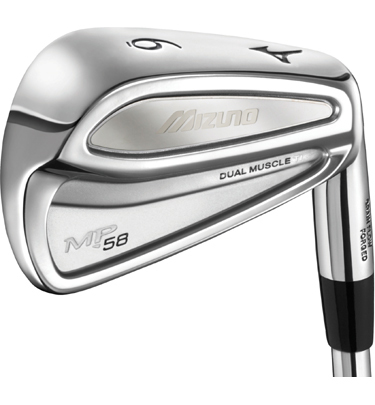 Mizuno MP 58 irons at http://www.golfshoppingshop.com Price only $358.99. During the complex grain flow forging process, a high-tech titanium metal is forged into the outer muscle of the iron, which not only delivers the feel, workability and shape every MP player desires, but also takes playability in an MP iron to a whole new technological level. The MP-58 irons achieve the rare combination of a penetrating ball flight, increased MOI, and superior feel, all in the ultimate player's head shape. Where to begin with these irons...For starters, these are probably the best looking Mizunos I have ever seen. Many people say they got too much going on as far as the titanium insert which I think makes the club look better, and at address, they look nothing short of a blade with maybe a little thicker top line. As far as performance, at first I thought I picked up a $1000 mistake because I just wasn't hitting them that good. BUT, got them 2' upright and the right grips, let me tell you, I actually get two feelings from these now, PURE BUTTER and PURE POWER. I promise that is what these feel like. Basically the same feel of a quality forged club with a HOTface. Shots just rifle through the air. Shaping shots is not a problem either, these things are deadly accurate if you put a good swing on em. I am not Mizzy fanboy by any means, but I just can't find a better forged iron at the moment. (the new callaway x-forged were money but kinda harsh on slight mis-hits)Buy these and I promise you will not be disappointed, if you are, then its your swing. And do yourself a huge favor and get fitted, this goes for ANY clubs you buy. There is crazy technology for fitting, take advantage, I did and now these things are CORRECT!!. hit em straight. Never dealt with but I hear its top notch. I just tried these at the range. 3, 6, & 9 irons. I'll admit to miss hitting a couple of 3 irons but mostly these were wonderful feeling pretty easy to hit irons and seemed deadly accurate. Hard to tell distance at the range. The ball flight is lower than I usually get but I hit the ball very high so I'm fine with that. These felt sweet and went very straight unless you tried to fade or draw the ball. A couple of loose swings with the 3 iron though gave very ugly results. Never hit a bad shot with the 6 or 9. I don't want to suggest these are too hard to hit. I hit maybe 20 3 iron shots and had only 2 bad shots. What gives me pause is that the bad shots were pretty bad. Both were shanks and I've never done that with a 3 iron before. I would suggest you try these before you buy these. I'm going to give them another go myself. On top of feeling very sweet they are gorgeous clubs!